The new version of the 2007 team, Merlin was launched on Sunday in Derby. Pearl Izumi-Planet X-High5 is made up of riders who formed the heart of Merlin with some new additions. Always a team to focus on developing riders, director Cherie Pridham and manager Eddie White have added even more youth for 2008. Under-23 national circuit series winner Jon Mozley and Liam Holohan will ride alongside talented off-roader Steven Adams and national medal winning time triallist, Matt Jones. They are joined by Raphael Deinhart, who at 21 will be the oldest member of the team, Ashley Finn and George Atkins, who won the Olympic youth road race in Serbia last year. 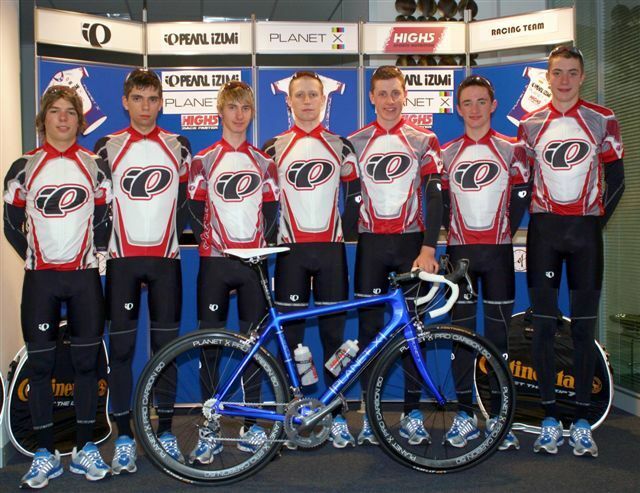 The team will be race fuelled by High5, wear Pearl Izumi clothing and ride Planet X bikes. They have also been given some very sought after Continental branded retro jackets for off-duty moments by their tyre supplier.